Want to thrive in the restaurant industry in 2018? Serve boneless chicken. Led by three of the hottest restaurant chains in the country, Chick-fil-A, Zaxby’s and Raising Cane’s, concepts that serve chicken without bones have flourished, taking share at a time when the industry has stumbled. According to data from Technomic's Top 500 Chain Restaurant Advance Report, all chicken restaurants grew by nearly 8%. But chains that specialized in boneless products saw sales increase more than 15%. By comparison, more traditional bone-in chains’ growth was less than 2%. More notable is this: Boneless chains are quietly about to overtake bone-in concepts in terms of sales. The six boneless chains in the Top 500 generated $12.3 billion in sales last year. By comparison, the 13 bone-in chains generated $12.8 billion. Given the growth of those six boneless chains, they are probably a larger share of the chicken pie right now. Most of that $12.3 billion came from one chain: Chick-fil-A, which generated 14.2% system sales growth in 2017 to just more than $9 billion, according to Technomic. 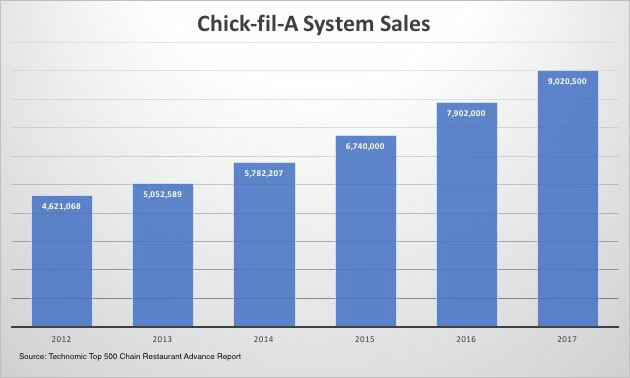 That’s amazing growth for a chain that is among the 10 largest in the U.S.
Chick-fil-A was the seventh largest restaurant chain in the country in 2017. It will likely leapfrog Wendy’s and Burger King this year to become at least the fifth largest chain, and will then overtake Taco Bell and Subway to become No. 3 by 2019, barring some unforeseen circumstance. But the boneless chicken market isn’t limited to Chick-fil-A. System sales at Raising Cane’s grew by 30% last year, making it the fastest-growing chain among the 100 largest concepts. Zaxby’s grew by 13% last year, to $1.9 billion. Then there’s fast-growing Slim Chickens, which generated 46.3% system sales growth in 2017 and now generates $112 million in system sales every year. None of this is to say that bone-in places are suddenly struggling, though taken as a whole, their growth was muted in 2017. Despite a down year for same-store sales, for instance, Popeyes Louisiana Kitchen’s system sales grew by 4.5% to more than $3 billion. System sales at Bojangles’ grew by 3.8% to $1.28 billion. El Pollo Loco system sales grew by 5.6%. Then there’s Wingstop. For this exercise, I included the chicken wing chain among its bone-in competitors, though it is its own animal and doesn’t compete directly with any chicken restaurant. It’s more like a pizza chain, really. In any event, Wingstop’s system sales grew by 11% last year. But many of the larger bone-in chains’ sales have been muted, and there are struggling companies like Pollo Tropical, where system sales fell by 11.2% last year. Analysts have speculated that consumers simply don’t like bone-in chicken any longer, though such an explanation is too simplistic—many of the bone-in chains have legacy locations in weak markets, for instance. More likely is that the boneless concepts are taking advantage of a consumer that has been putting more money into specialized restaurants in recent years. Chicken caters to a wide variety of consumers. And the boneless product fits well with consumers’ growing demand for more convenience-oriented fare. It’s kind of hard to eat fried chicken while driving. For whatever reason, bone-in chains haven’t been able, or willing, to tap into the boneless market. The risk, ultimately, is that a big chain discovers their success and tries to replicate it, which is already happening. As we wrote about last month, McDonald’s sees the chicken market as a potential growth vehicle. Indeed, it’s already a major player in the boneless market, and found some success with its Buttermilk Crispy Chicken Tenders last year. It generated more system sales in 2017 than all of the chicken concepts combined.